Hi Mom! 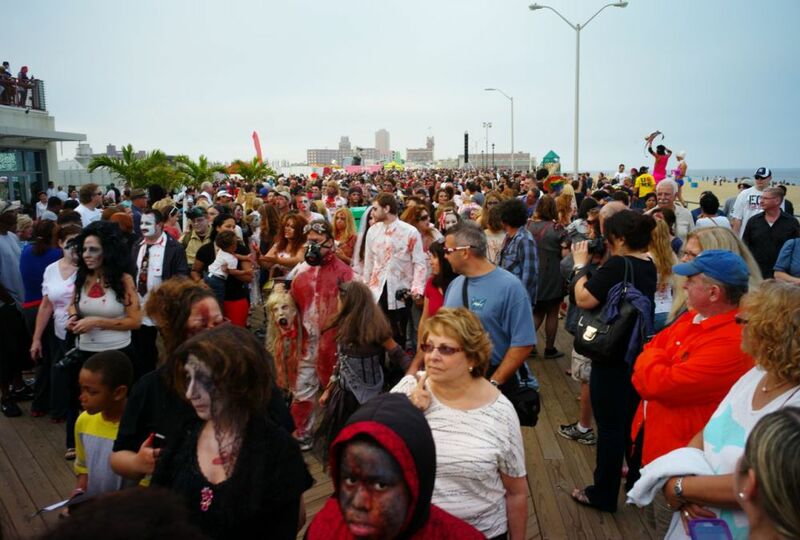 Bamboozle attracted 80,000 people to A. Park in 2012. Many crowded the rentals in OG. 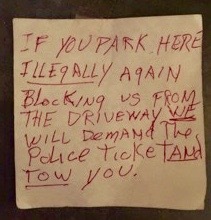 Did you ever hear certain Grovers belittle the parking complaints of residents in this way? I have, and it is a cliché chosen to intimidate residents and trivialize the effects of parking distress on their quality of life. Such talk often emanates from the mouths of realtors and speculators who want to build condos, sell houses, and rent stores. And they want to minimize the parking problems here to naive prospective buyers and renters. The truth is that there are many 3-day weekends and weekdays each summer and also on some spring and fall weekends where the number of cars exceeds the spaces in the Grove. The “season” actually extends from May through October. Did you happen to notice the syndrome during the Giant September Flea Market which just happened? The F bombs were flying around the Pathway and landing on the two Norms’ porches. This problem is about more than parking. Crazed drivers were circling our streets looking for a space. They were frustrated, wild-eyed, hot, and angry. They were lured by advertisements promising a good time. (Fake news and false advertising) None of the organizers provided any parking assistance (such as shuttles.) If a parking space were to appear, its life expectancy was averaging 15 seconds or less. This is no way to live; I don’t care if it is “only” 50 days each year. I just learned that 20,000 attendees are expected for the inaugural Sea Hear Now Festival (art, music and surfing) in neighboring Asbury Park on the weekend of September 29 and 30) Much of the available parking near the boardwalk was acquired by the promoters from the city. Not sure if this is to provide parking for attendees or to have space to stage. AP will also receive $1 from each ticket sold. I assume we Grovers will be competing for spaces over here in Ocean Grove as the spillover would appear inevitable. Just when we were beginning to enjoy the relative quiet of the post season. Editor’s note: Thanks Rosemary. Not only is the Camp Meeting Association of Ocean Grove striving to have more tourist weekends year round, so is A. Park whose parkers will be inundating the Grove. The AP crowd won’t be happy until every weekend in their city is filled with tourist lures. And, if the North End extravaganza eventually gets built here, there will be yet another source of that sucking sound which draws cars, SUV’s and giant trucks into the Grove adding to air pollution, water pollution, noise pollution and culture pollution which we already are experiencing. My son’s dog Pooja can’t even find a place to poop lately. The Zombies come by the thousands. Last year a few lurched over to the Grove; this year it is October 6. 2013 Zombies. A. Park. At least 20,000 will come this fall. Paul Goldfinger photo. Click to enlarge the mob. ridiculous, pointless, or nonsensical: full of wild schemes and cockamamie ideas. 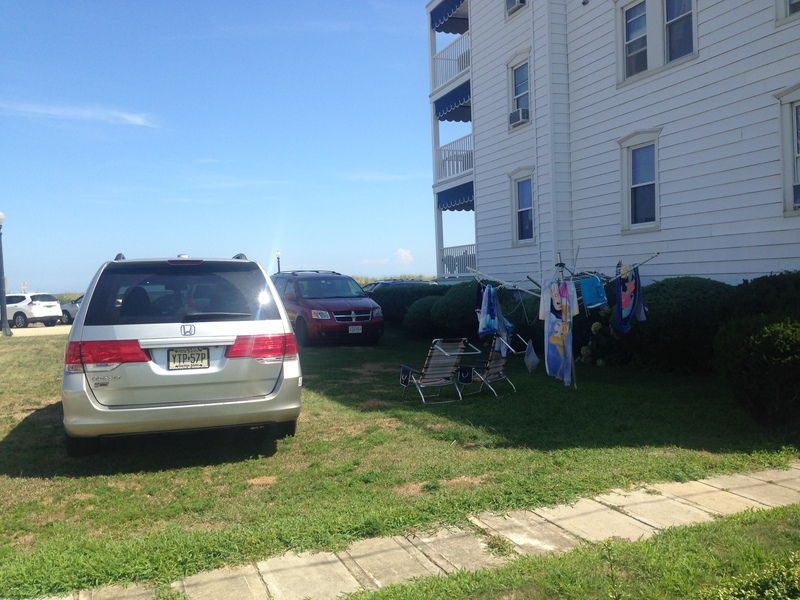 Games people play: The Parking Wars in Ocean Grove—–a never ending saga. It was the beginning of a beautiful beach weekend. 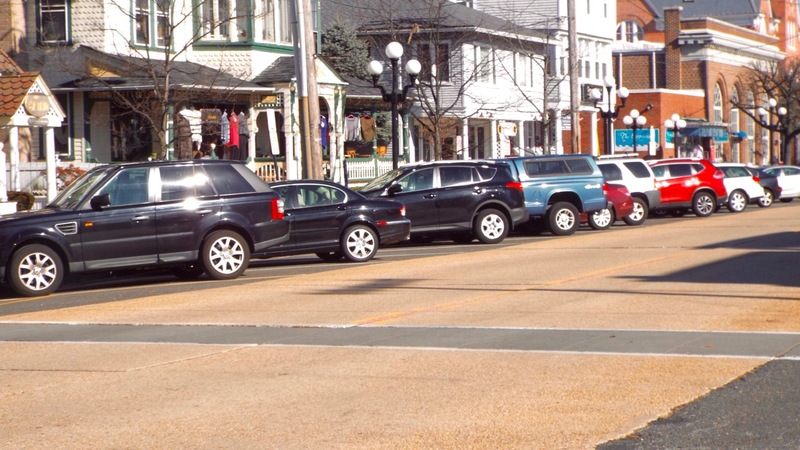 On Friday afternoon, the floodgates of vehicles had already opened for another gridlocked weekend in the Grove. Ironically, both these parking games were being played out within one block of each other, almost on top of the NTPD substation next to Thornley Chapel. 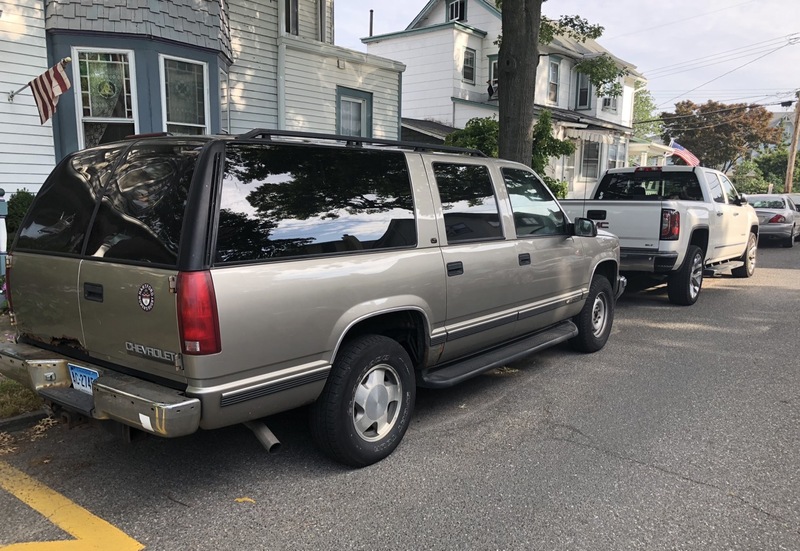 By Saturday, I had to park over 3 blocks from my house, and while walking back, the sloppiness of parking on our streets was evident, with large segments of curb being empty, but not quite large enough to be a parking space. If only some parkers were more considerate and less arrogant. Some have suggested marking the parking spaces in town, but that would, I am told, take up even more parking spaces given the sizes required. Have you noticed how large each marked handicapped space is? 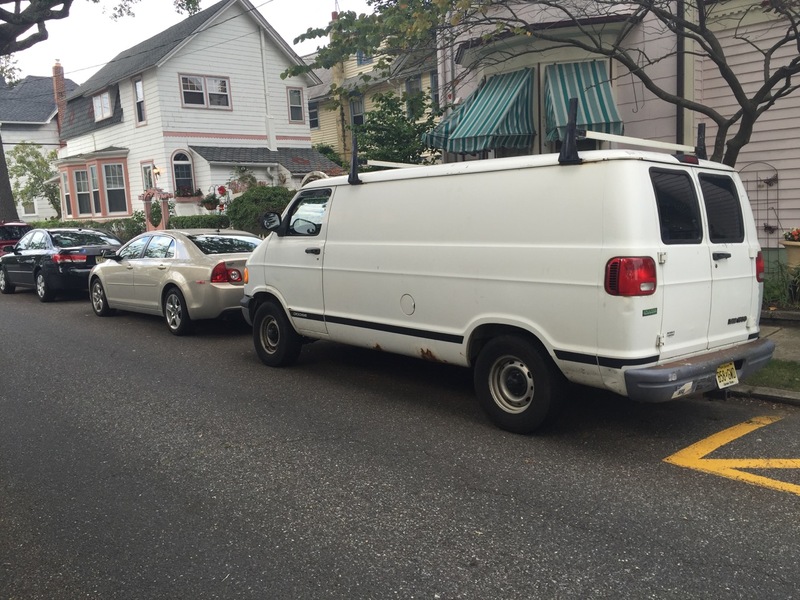 Games people play: The parking wars in Ocean Grove—– A longer saga than Star Wars. Delaware Ave. in OG. 7/14, 2018 Blogfinger photo. Two huge vehicles. The parking math is fairly simple: The two variables are parking spaces and cars. And when there is gridlock, the number of cars exceeds the number of spaces. One sub-variable is that so many people are now driving huge cars, SUV’s and vans (as in the photo above); the effect is to reduce the number of spaces. If we all bought little cars, as they do in Europe, parking spaces would be more plentiful and easier to navigate. Far and away, the major variable is the number of cars in town. And unlike other shore towns with parking issues, we have the Camp Meeting Association, which has considerable programming designed for out-of-towners. And we have a Chamber of Commercials which finds it necessary to have large events and to close our downtown streets intermittently. Who does that benefit? So we have more grid-lock events than other shore towns, and we are the smallest. Part of the calculation is that many times, especially in the “off season,” there are plenty of spaces available for residents, but that doesn’t lessen the problems in-season which is now a minimum of 4 months each year. 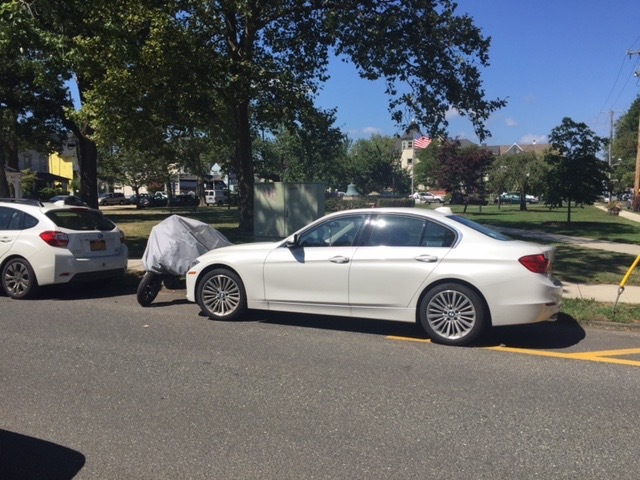 During that time-span, parking often creates problems for those who live in town, including many folks who pay taxes and others who pay rents to help pay taxes. Why are tourists considered to be more important than residents? Hey Mayor: What do you say about that?? The mayor of Belmar says that his residents are the most important. And then there are the games people play which affect the number of spaces. We’ve been reporting on that. We recently mentioned handicap spaces which are plentiful in the Grove and reduce the number of available (not total) space, and which may be used inappropriately . For example, if a handicapped person has two cars, and has stickers for two cars, his wife may be seen parking one of those cars in the handicap space, but she has no handicap, only the car does. That is wrong! There are those who say that the parking issues in the Grove are insoluble. And that is definitely true if no one tries to solve the problem. Someone pointed out that less shoppers come into town in season because people hate the “find a parking spot” quest. If so, there should be less cars and perhaps more spaces. Such a dynamic would hurt the downtown shops, but not one of the businesses in town or the Chamber of Commercials has concerned itself with resident parking. Similarly, less big-time Saturday night shows will result in less cars on those Saturday evenings. And every time the Township approves a multi-unit building, as will probably happen with the single-family Aurora (applying to become a 4 family site contrary to zoning and the Master Plan) and as happened many times in the past with condo conversions/no parking provided, the number of cars keeps growing while the numbers of spaces pretty much stands still. Or if the township ignores zoning and allows the North End to become a redevelopment area with a “get-out-of-jail” card to do whatever they want, such as 165 condos and a hotel, there will be fewer spaces available and more cars, even if there is a garage for hotel guests and homeowners. Imagine what the effect of a hotel alone would be. How about a wedding on a Saturday night? Or the opening of Hooters inside the hotel. The parking issue is not just that; parking creates a ripple affect that can affect other variables—-such as quality of life for residents—-something which the Township and the local organizations such as the Groaners routinely ignore. So, if you can’t get a parking space, we wish you shelter from the storm, lemonade in July, and love. This conversation was begun in the context of storm news, as a snow storm hit Ocean Grove on January 27, 2015. Comments are posted chronologically here instead of the usual location. Editing might be required for clarity, grammar, spelling, and sanity. Pam. Jan 28. “It is a shame that as tax payers we aren’t entitled to one parking spot. Nevertheless my husband and I try to show courtesy to our neighbors even in the summer and other seasons. We try very hard to park in the same spots every time thus leaving spots free for our neighbors to park in front of their houses. Doubting Thomas. Jan 28. This reminds me of internet etiquette, which is still evolving. Rules of politeness must be written down and acknowledged by most civilized citizens if they are to be honored, but such rules don’t exist for Grovers with snow drifts. So we must rely on the instincts of residents who perhaps have certain values in their DNA, or, at, least in their subconscious where common themes exist based on our culture. Having said that, do unto others as you would have them do unto you, because the NTPD won’t get in the middle of this unless there is blood on the snow. Embury Resident. Jan. 29. This is intended for the parking etiquette conversation. I have a driveway and only come down on weekends. I try to be a good neighbor and pay someone to clean my (empty) driveway & sidewalk after a snow fall. I did this yesterday. He cleaned everything, only to call me today to let me know that one of my “neighbors” threw all the snow he shoveled from his property onto my driveway. Not very neighborly. Paul Devine. Jan. 30. I am not in OG many weekends in the winter. Without reserved spots neighbors are able to use the spot which eases parking for our wonderful neighbors. I do agree that something should be done with cars that are warehoused on the street and not used. Jo Ann Marino. Jan 30. 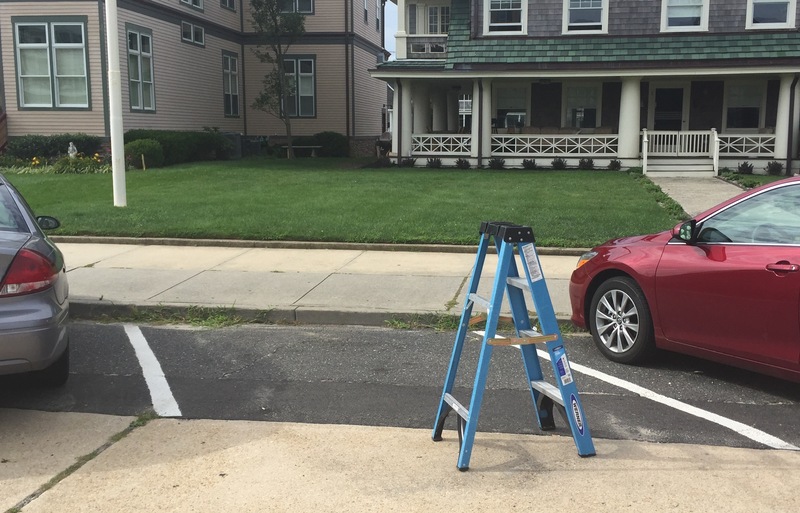 Homeowners in Lavallette who do not have a driveway pay an annual fee to the town for a designated parking space on the street near or outside their home. A win win situation. Paul Goldfinger. Jan 30. Jo Ann—There are a number of constituencies in Ocean Grove including tourists, homeowners, renters, merchants and others. The group that is ignored in this conversation are the homeowners who live here year round or part time. They have been ignored as far as the parking situation is concerned. I totally agree that we too should receive a reserved space in front of our homes. This is a common solution around the state of New Jersey. Wisher. Feb. 1—I am bothered that few people shovel. Now ice and snow have solidified around cars, and cannot be removed. So instead of winter in New England, the scene looks more like Arctic Station Ocean Grove. 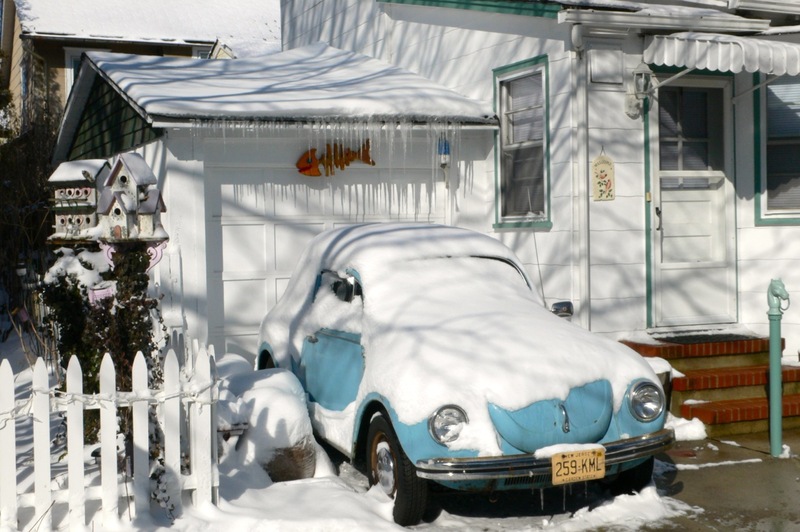 There are many able-bodied hipsters renting in my Asbury Ave. neighborhood with nice cars and no shovel. Out of the whole two blocks around me, it was just me and another older guy shoveling our spaces. Then we pull out, and someone is there in the space when we get back. It is a shame because it is great exercise and a way to meet people through simple acts of kindness. Just a minute: The Neptune Committee minutes are available for January 8. We offer excerpts about parking permits. The Blogfinger cow is covering the Committee meetings and any undder events where he/she can report on fake news. And support the Blofinger cow. 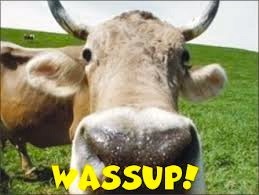 Our milk is organic, and contains no methane gas. From the Neptune Township Committee meeting minutes on January 8. Only 3 committeemen were present. 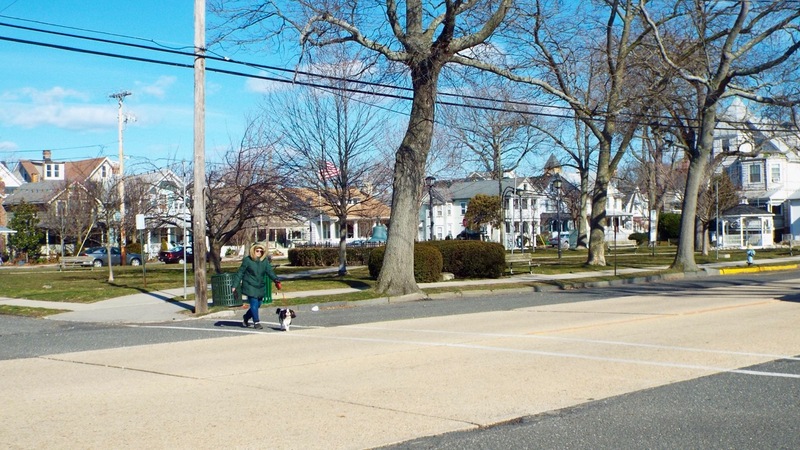 Editor’s note: The mayor refers to “eligibility of Neptune Township residents who do not reside in Ocean Grove.” This suggests that the Mayor is out of touch with the reason for a permit plan. And,the opinions put out by Committeeman Lane that “a permit plan would be a hardship to tourism and most do not want permits” are two unsubstantiated fake news remarks unworthy of a high Township official. 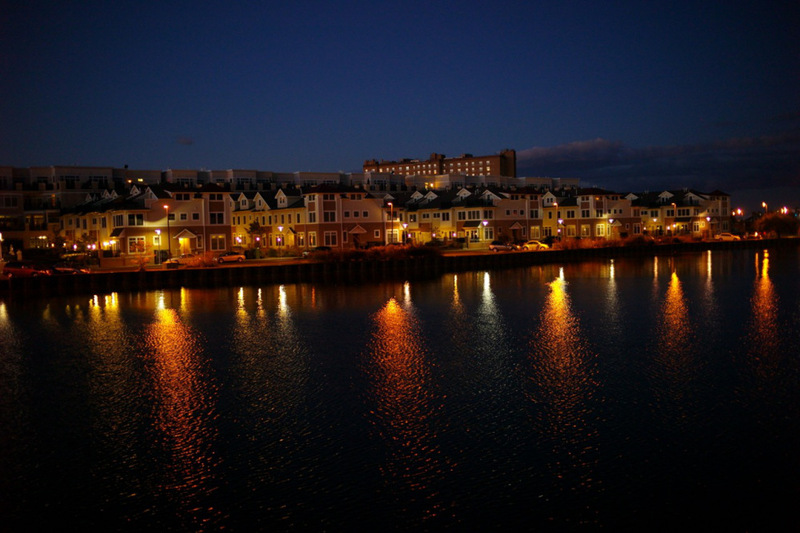 The night life over in A.-Park-By-The-Sea and don’t forget your credit cards. Paul Goldfinger photo. 2016 © Click to enlarge. 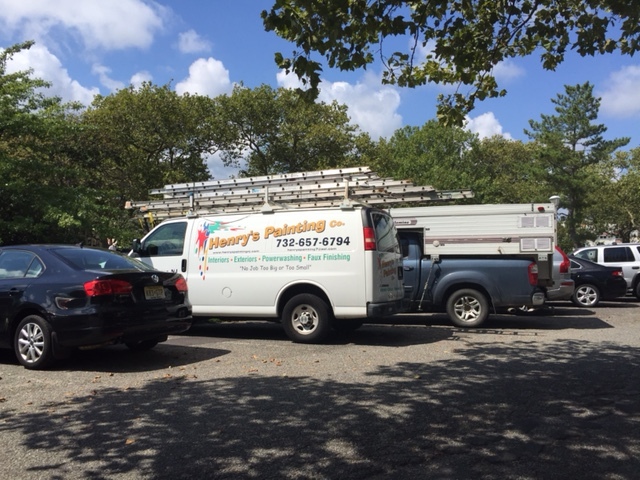 Editor’s note: About 6 months ago we reported that Asbury employees such as restaurant workers are intentionally going straight to Ocean Grove for parking, especially at the north end near Wesley Lake and behind the Windmill. From there they walk a few blocks to work by crossing the access bridge nearby. This has proven to make parking an even bigger issue for those of us who live in that part of the Grove. We live near that access bridge and we often see visitors, mostly 20 and 30 somethings, pile out of a car, often trailing suitcases, as they head for the New Jersey Avenue bridge to A.Park. And there are large numbers who, heading for dinner out or bar hopping, do the same thing except without the suitcases. And then they come back late and loud. This is a new and growing situation which we first reported on in 2015. The conversation above indicates that the knowledge about free parking in OG has spread to a wider circle of parking manipulators. NICKI MINAJ “The Night is Still Young.” But Nicki, can’t you keep it in A. Park? We’re sleeping in Ocean Grove. This is what the north side of Main Avenue looks like currently with diagonal parking. This scene is near New Jersey Avenue, and the new plan will extend this to Lawrence Avenue. Jean Bredin photo, Blogfinger staff.© 2/16/17. This is the north side of Main Ave. along the edge of Firemen’s Park. Imagine it clogged with diagonally parked cars. © Jean Bredin photo; Blogfinger staff. 2/16/17. In a Coaster article (Jan. 25, 2017) it was reported that the Township Committee approved “almost 100 new parking spaces”and that the Committee was “acting on recommendations presented by the ad hoc OG Parking Task Force.” That task force has members on it from the OGHOA. The plan includes creating diagonal head-on parking on the north side of Main Ave. from New Jersey Ave. to Lawrence Ave. The same is planned on the west side of Central Avenue from Heck to Webb avenues. But diagonal parking is ugly. The “new spaces” are created by cramming more cars into a given space where currently there is parallel parking. Diagonal parking may be OK for commercial areas, but in residential areas it is not suitable. On Main Avenue, starting from the eastern edge of Firemen’s Park and heading west, the diagonal parking will look congested and will visually and actually narrow Main Avenue. Currently that portion of the Avenue has an impressive and welcoming boulevard look. For visitors who come into our historic town, they will not enjoy the same openness that currently shows off the Grove at its best with historic homes and a lovely park. In addition the town will lose one of the few places where a bus or truck can legally pull over and give some respite for the drivers to get their bearings or have a coffee. Resident Joyce Klein who is a member of the OGHOA and chairman of their parking committee said, “This is a great start* but I hope to think that this is the beginning and not the end of the parking study.” She is also on the task force. So we will get some more spaces, but we don’t need more congestion and density as the price to pay in our residential areas while the town continues its slide downhill. The policy makers think that this will be wonderful, but do you think these task force people are doing the right thing? It seems that they believe that all Grovers care about is parking and that we will accept any new spaces no matter the price. Do you think the task force gave any consideration to the appearance of our town—–how about the more important variables such as air, space and light? How about our quality of life? This plan of squeezing more cars onto our streets fits in with the worrisome current pattern of more condos, more density, and more crowding. Making more spaces is not necessarily better than leaving those streets alone. Who is this really helping?–the commercial and real estate interests, or the people who live here? 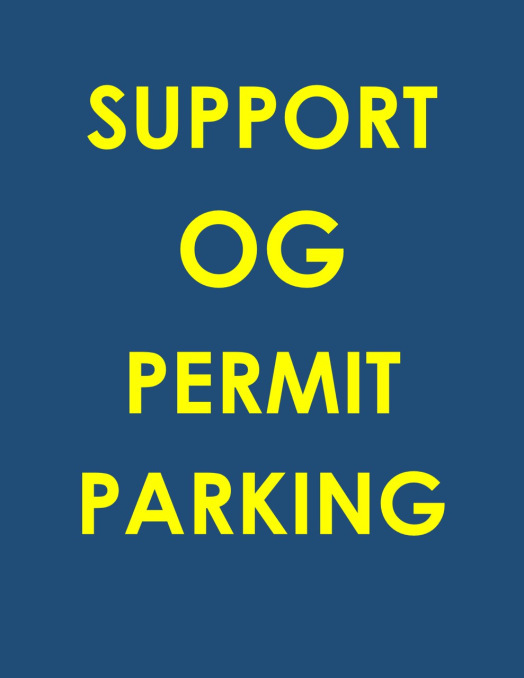 Help the residents with parking stickers and do something to reduce the numbers of cars coming into town and the number of town-clogging events that are too often and create temporary paralysis for OG tax payers. Or build a parking garage somewhere. This plan will be implemented by Memorial Day. Other ideas are also being considered, including even more diagonal parking on other parts of Central Avenue. Signs of the Times: Reserved parking—but not in OG. 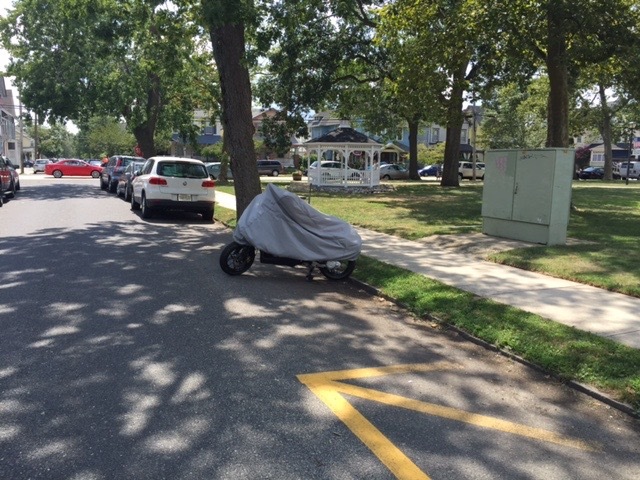 While riding our bikes in Allenhurst today my wife and I came across the solution to Ocean Grove’s parking problem. 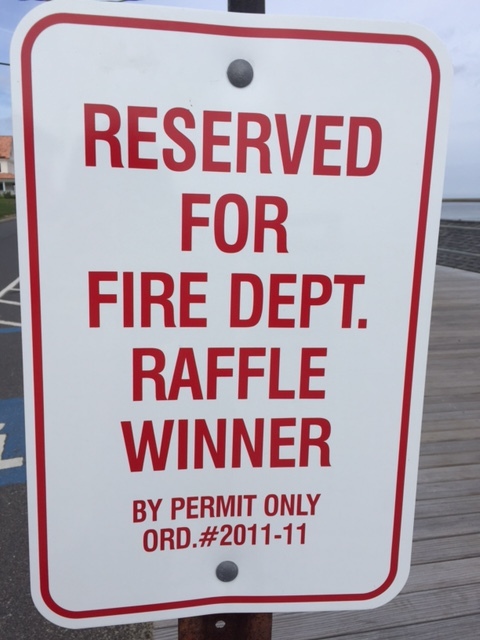 Apparently, winners of the car raffle have a designated spot. Editor’s note: If only our town would pass an ordinance to take special care of OG home owners. But Neptune (the town, not the planet) seems to have little interest in our issues; so, even if breaking up is hard to do, perhaps we citizens should take another shot at seceding from the Township ; we could even merge with Allenhurst. Or we could become the northern part of Palm Beach. , “No curb-cut – no driveway – no garage – NO PROBLEM. Just jump the curb and park in your yard – also know as the historic setback! !” Bath Avenue at Ocean Avenue, OG. 8/19/16 © Neptune PD traffic vehicle spotted around town. “Mr. Henry parks here most days when, we assume, he is working in town. In fact,the truck remains overnight as well as now spending the weekends. He has clued in the owner of the next truck, who also remains all weekend. These guys commute from elsewhere to these vehicles. One sign says Manchester. They are at Central between Surf and Atlantic facing Founders Park.” A new piece added to the parking puzzle. “Blogman- Upon returning to the Grove at 7:30 pm, parking proved to be elusive. After driving up many streets we saw someone getting into at van on Abbott near Pilgrim. We politely waited for the space when a passenger placed two cones on the street as he was pulling out. I asked him why he did that, he ignored my query and drove away. The people sitting on the porch in front of the “coned” space informed me that it was their next door neighbor and not them who encumbered the space. The cones even had a house number on them, which corresponded with the house next door. I removed the cones, placed them on the sidewalk in front of the house matching the number and parked in the space. Hopefully, the car will not be vandalized by the illegal “coner”. Parking in the Grove photo gallery. Send us your parking photos with a one or two sentence message. Creative parking #1: This cyclist parked last week so that no one could squeeze in behind. He succeeded until busy Sunday morning 8/14/16. (see below). Blogfinger photo. This is the commercial vehicle which Pat Ralston says (see her comments) has been warehoused next to her house for 8 months and it also has an expired sticker. He takes another home again to find me waitin’ for him” But where will she park when they get home? 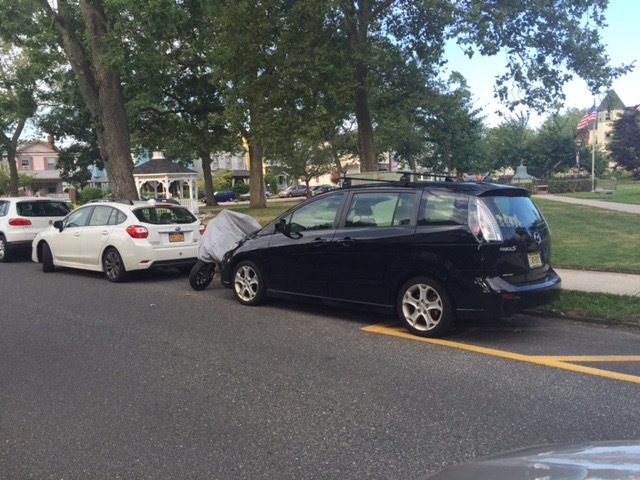 But what if it is a summer Saturday night, and she and her baby have to park at Clancy’s? As has been pointed out before on Blogfinger, the parking issue is about much more than where we put our car. 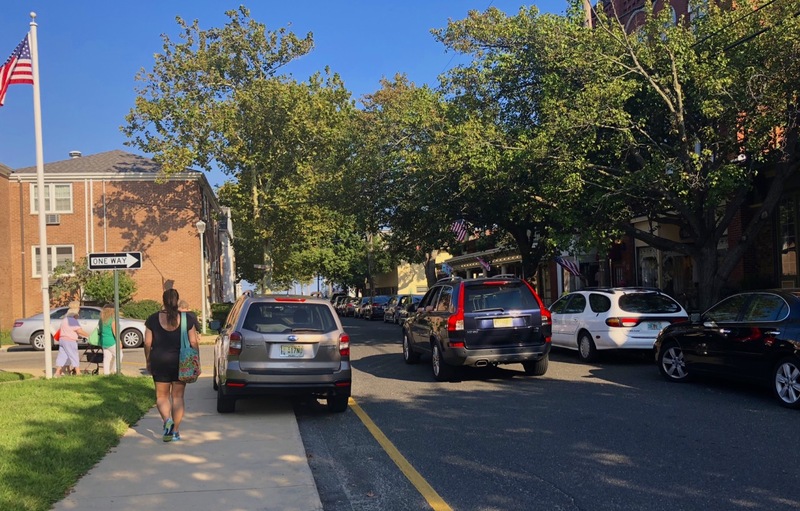 It is a lifestyle problem which effects how much we appreciate living in this town; and it is about how our local government cares about special interests which get special attention, but where is some special attention for the residents of Ocean Grove?